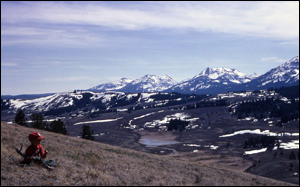 Gallatin Mountain Range, as seen from Terrace Mountain. Legal protections for sensitive wildlife habitat in the Gallatin Mountain Range near Yellowstone National Park were upheld by a federal court in Montana, rejecting a challenge to open the area to increased snowmobile traffic. The ruling, issued in late June, upheld a U.S. Forest Service order restricting snowmobile use throughout much of a congressionally designated wilderness study area in the Gallatin Mountain Range, which borders the northwestern corner of Yellowstone National Park. The USFS imposed the snowmobile restriction after being successfully sued by Earthjustice for previously allowing excessive snowmobile use that degraded the wilderness quality of affected lands. Citizens for Balanced Use, a motorized-recreation group, challenged the snowmobile restriction. In rejecting the group’s challenge, the Montana court agreed with Earthjustice that governing law prioritizes preservation of wilderness quality, instead of snowmobile traffic, in the Gallatin Range. “The Gallatin Range contains the most extensive undeveloped public lands adjoining Yellowstone park that have not yet received permanent wilderness protection from Congress,” said Earthjustice attorney Timothy Preso, who represented conservation groups in the case. Earthjustice represented the Montana Wilderness Association, Greater Yellowstone Coalition and The Wilderness Society in the case.